The Company was founded in 1939 by Lawrence B. Sheppard, one of the principal partners in the Partnership of Clinton M. Myers, Harper D. Sheppard and Lawrence B. Sheppard. The initial function of the Company was to provide a sale venue for yearlings of Hanover Shoe Farms. Hanover had previously been selling its yearlings at the Old Glory Sale, which shut down in 1938. The first yearling sale in 1939 held at the Pennsylvania State Farm Show Arena in Harrisburg grossed a total of $75,575, with 42 Hanover yearlings grossing $55,750. Mixed horses brought an additional $20,000 for a total first year sale of $95,575. Other significant consignors included Arden Homestead Stable, Mahlon ("The Shoe Wizard") Haines, and Village Farm. With the exception of a brief period during World War II when it was held at the York Fairgrounds, the Standardbred Horse Sale has been held at the Pennsylvania Farm Show Complex every year since 1939. "The first $1,000,000 sale occurred in 1947, when the gross sale reached $1,005,100. "Lawrence Sheppard recruited Bowman A. Brown, Sr. to become the General Manager of the Company. Mr. Brown at that time was a principal with The Telegraph Press in Harrisburg, Pa., which published The Harness Horse, a leading weekly harness racing journal from 1938 until the mid 1980s. He served as General Manager of the company until his death in 1968. Hempt Farms became our second-oldest consignor by entering its first consignment in 1946. The first $1,000,000 sale occurred in 1947, when the gross sale reached $1,005,100. Hanover yearlings represented 26.3% and $264,900 of the total sale, and 45.1% and $587,250 of the yearling sale. The consignor list had expanded to include Bonnie Brae Farm, Castleton Farm, W.H. Kane, W.H. Dickinson, Henry H. Knight, Delvin Miller, S.F. Palin, C.W. Phellis, W.N. Reynolds, Frank Safford, and Ben White. Mr. Sheppard also retained the services of the outstanding auctioneer of his day, George Swinebroad. Mr. Swinebroad was reputed to be the auctioneer who produced the radio commercial for Lucky Strike Cigarettes that began with the usual auctioneer's "sing song" selling a particular lot of choice tobacco, and ended with "Sold American!" He had a special and commanding presence on the auction stand, and had a unique ability to revitalize the sale of a deserving horse that had temporarily stalled. Milton "Laddie" Dance was the first assistant auctioneer. Later, Dance was replaced by Tom Caldwell, who after the death of Mr. Swinebroad became the most sought-after auctioneer for both Standardbred and Thoroughbred horses. Auctioneers rely heavily on a group of bid-spotters, who locate themselves throughout the arena to relay bids to the auction stand. 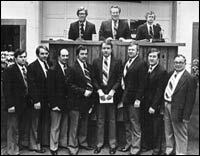 Paul Martin, Sr. was part of the original group of bid-spotters, and was, without doubt, one of the finest ringmen to ever work at a horse auction. In 1958, the Company sold Dancer Hanover for $105,000 to his namesake, Stanley Dancer. Dancer Hanover was the first yearling, Standardbred or Thoroughbred, that was ever sold for $100,000 or more. Tom Caldwell did the auctioneering for the horse. When the gavel finally fell after the spirited bidding, the sale was stopped while the successful bidder received a standing ovation from the appreciative crowd. By 1967, the total gross sale at Harrisburg had grown to $5,395,000. Major consignors included Hanover Shoe Farms, A.B.C. Farm, Allwood Farm, Arden Stock Farm, Hempt Farms, Dana Irving, Meadow Lands Farm, K.D. Owen, Two Gaits Farm, and Yankeeland Farm. On February 26, 1968, Mr. Sheppard succumbed to emphysema, and within a short time Bowman A. Brown, Sr. also passed away. Subsequently, Charlotte N. Sheppard was elected Chairman of the Board, Paul E. Spears was elected President and CEO, John F. Simpson, Sr. became Vice President, and Bowman A. Brown, Jr. was appointed General Manager of the Company. Bowman Jr. served the Company in various capacities from World War II until his death in 2003. Soon thereafter, a fire in one of the storage sheds at the Farm Show Arena destroyed all the wooden stalls owned by the Company. With the 1968 Harrisburg Sale only months away and the Company undergoing internal reorganization, Mr. Spears successfully lobbied the Pennsylvania legislature for a $160,000 appropriation for the Commonwealth to purchase new metal-framed stalls for rental to the Company and other interested shows. The stalls arrived just in time for the 1968 Sale. Cashiers and bookkeepers were hired and trained, and a new system of forms and records was established to provide reliable information for tax and other reporting purposes. The first Cashier to be hired at this time was Edward Rogers, CPA, who is currently one of three Pennsylvania Harness Racing Commissioners. Paul Keim was charged with overseeing the care of the horses, and organizing the "hipping" and presentation of horses to the sales ring. John Mooney was his assistant. The Harrisburg Sale had long been conducted in the "Large Arena" at the Farm Show. The Large Arena was very dusty from the tannin bark flooring, and the acoustics were very poor. To change the atmosphere and create a more pleasant setting, Farm Show management approved renovations to the "Small Arena". An innovative "Now Selling Sign" was installed, and carpet was laid to improve the appearance of the sales area. An air filtering system was engineered for the Small Arena, and shredded paper was substituted for straw in the stalls to counteract the dust problems. After Hanover Shoe Farms also installed carpet throughout its show area, carpet soon became standard for consignors at Harrisburg. Tom Caldwell and his sons Scott and Chris assumed the autioneering duties for the Company after the death of George Swinebroad. In time, the Caldwell family decided to concentrate their efforts in Kentucky. Vernon Martin became the head auctioneer, with Danny Greene and Larry Martin rounding out the auctioneering staff. In 1972, Bowman A. Brown, Jr. chose to devote more time to managing the affairs of The Harness Horse magazine. M. Murray Brown succeeded Bowman Jr. as General Manager. Clyde Sterner replaced Paul Keim and John Mooney in the Barn Area, and Dale Welk became his assistant. Ralph E. Lemmon, Jr. became the Head Cashier and overall Manager of the Cashier's Office. When Clyde Sterner retired in 1989, Dale Welk assumed his duties as Operations Manager. Both Yearling and Mixed sales grew steadily in size and importance over the years. Yearlings grossed $3,957,750 in 1967, increasing to $29,888,500 in 2003. Mixed horses grossed $1,437,300 in 1967, increasing to $20,118,000 in 2003. Overall, the Harrisburg sale dramatically expanded from $5,395,050 in gross sales in 1967 to $50,007,400 in 2003. In 1998, Paul E. Spears retired after serving for thirty years as President and CEO of the Company. Russell C. Williams, a grandson of Lawrence and Charlotte Sheppard, was elected as President and CEO, and Mr. Spears became Chairman. The management team included Murray Brown, Jim Simpson, Jim Harvey, Ralph Lemmon, and Dale Welk. In 1998, the Company grossed a record $42,005,800, surpassing the $40,000,000 mark for the first time. Subsequently, the pace of technological innovation accelerated. A new electronic Customer Billing System was developed. The Saleco pedigree data collection program freed the Company from an obsolete catalog typesetting machine and tied us into the USTA's tremendous advances in equine database development. The "Now Selling" sign pioneered by Standardbred evolved into a computer-driven flat-screen video providing a clear image of all selling information over the sales ring. Live Sale results were posted on the Internet, with automatic updates every thirty seconds. Our Sale Video system made it possible for consignors to display their horses on the move throughout the Farm Show Complex. Yearling videos have taken their place alongside the catalog as a standard reference tool at all major sales. The 2007 Harrisburg Sale grossed an even more amazing $70,700,000.In 2004, Russell Williams became Chairman, Paul F. Spears was elected President and CEO, and Paul E. Spears returned to active management as Executive Vice President. The younger Spears had many years of involvement in the Standardbred industry under his belt, including becoming the breeder, through Windsong Stable, of the 2004 Triple Crown Winner: Windsong's Legacy. James W. Simpson, who became Senior Vice President of the Company in addition to his duties as President and CEO of Hanover Shoe Farms, is a son of John F. Simpson, Sr., a Hall of Fame horseman who was himself President of Hanover Shoe Farms for three decades. Reflecting a new sense of optimism from slots funded purses in New York, Ontario, Pennsylvania, and Delaware, the 2006 Harrisburg Sale smashed all records with total sales of $66,700,000. The 2007 Harrisburg Sale grossed an even more amazing $70,700,000. Standardbred Horse Sales Co. is well positioned to continue its leadership in the Standardbred horse sales industry. We take pride in the manner in which we conduct our business, and strive to maintain a high standard of professionalism in our dealings with customers.